I’ve just finished reading “The Wright Brothers”, a definitive study of the aviation pioneers by David McCullough. Very appropriate too, with man’s first self sustained flight on 17th December 1903 being remembered soon. Its a great read with vast reference material, illuminating the brothers’ relationships with their siblings and parents, taking you from their childhood through to Orville’s death in 1948. One aspect, which fascinated me, was their intense attention to detail. Nothing was left to chance and every aspect of their work was carefully studied, crafted, tested and rebuilt. At an early stage they realised that the figures and formulas they’ve used from the Smithsonian and revered aeronautical fundis of the time like Otto Lilienthal and Octave Chanute were pure speculation and simply wrong, so they worked out their own. In fact they built their own wind tunnel to test and verify their wing designs. This research took years – trekking between their home in Dayton, Ohio to the windswept Outer Banks of North Carolina, first with gliders and finally with the engine built to their specs by Charlie Taylor. Crumpled glider, wrecked by the wind, 10th October 1900. The brothers had a number of close shaves – one could hardly expect every new attempt at achieving what many believed was the delusional dream of a few madmen to go off without any problems. But throughout their persistent experimenting, they remained patient and constantly erred on the conservative side. 1. Plan and Operate (Prevent and Avoid). 2. Detect and Correct (Monitor and Challenge). 3. React and Recover (Mitigate the Consequences). “I tell them plainly that I intend for the present to experiment only under the most favorable conditions…I advise you most earnestly to stick to calms, till after you are sure of yourself. Don’t go out even for all the officers of the government unless you would go equally if they were absent. Do not let yourself be forced into doing anything before you are ready. Be very cautious and proceed slowly in attempting flights in the middle of the day when wind gusts are frequent…Do not let people talk to you all day and all night. It will wear you out, before you are ready for real business. Courtesy has limits. If necessary appoint some hour in the daytime and refuse absolutely to receive visitors even for a minute at other times. Do not receive anyone after 8 o’clock at night”. “I can only say be extraordinarily cautious”. Here was an aviator who understood the danger of weather conditions, the threat of external pressure and distraction, as well as the disabling power of fatigue. Apparently Orville heeded his brother’s advice and the first two weeks of the demonstration flights went off well. But on the 17th September 1908 a blade of the right hand prop cracked and broke off, vibrating enough to break a stay wire which had supported the rear rudder system. This rendered the aircraft uncontrollable and Orville crashed. He was severely injured and his passenger, Lt. Thomas Selfridge became the first fatality of powered flight. The wreck of Orville’s crashed aircraft at Fort Myer. “Now you understand why I always felt that I should be in America with Orville. Two heads are better than one to examine the machine”. 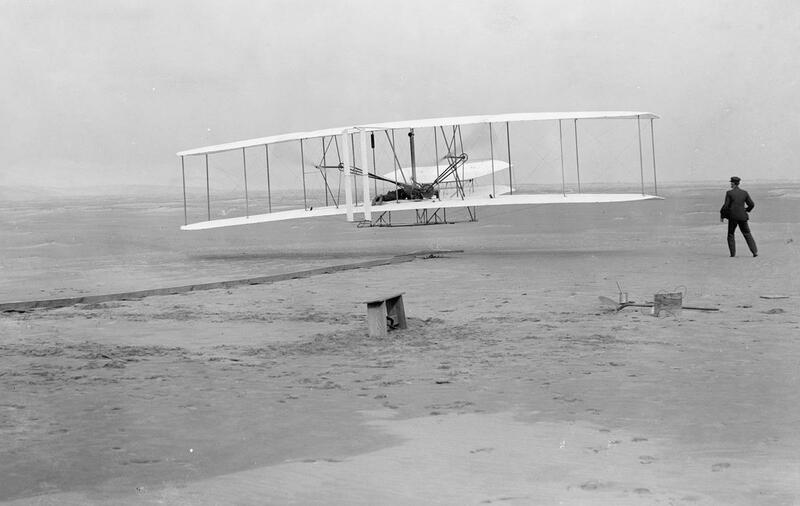 Erring on the side of caution was one of the Wright Brothers’ enduring qualities. They understood that risk was inevitable once one decided to become airborne – but they believed in well calculated risks. With 2016 about to become history, perhaps it is time to once again reflect on how far we’ve come since the dawn of powered flight at Kill Devil Hill, Kitty Hawk. I certainly do when I cruise in air conditioned comfort at high altitudes and Mach numbers. Perhaps it is also time to realise that we disregard many of the lessons learnt by those pioneers of flight at our own peril. Rather let us take a leaf out of the Wright’s book and “be extraordinarily cautious”. Here’s wishing everyone bon voyage and safe flights in 2017!